Arciform designer Kristyn Bester contributed the following article to the January 2014 edition of NW Renovation magazine. It is reprinted here for your convenience. Of all the possible home remodel projects, adding a guest suite or creating an ADU in the basement can seem the most daunting. From deciphering code compliance challenges to choosing an aesthetic that is most appropriate for your home, there are many questions that should be asked upon embarking on a basement renovation. What are my long-term goals for the space? Should I rent an ADU or list on Airbnb? In addition to expanding living space for day-to-day tasks such laundry, homework or television viewing, using basements to create rental income is becoming increasing popular. Rather than limiting their options to only hotels or bed and breakfasts, travelers are using sites such as Airbnb (www.airbnb.com) to search for unique accommodations. Since Airbnb listings range from farmhouses to treehouses and houseboats to high rises, it can take just a few clever design solutions to transform an unfinished basement into an adequate addition to the Airbnb club. 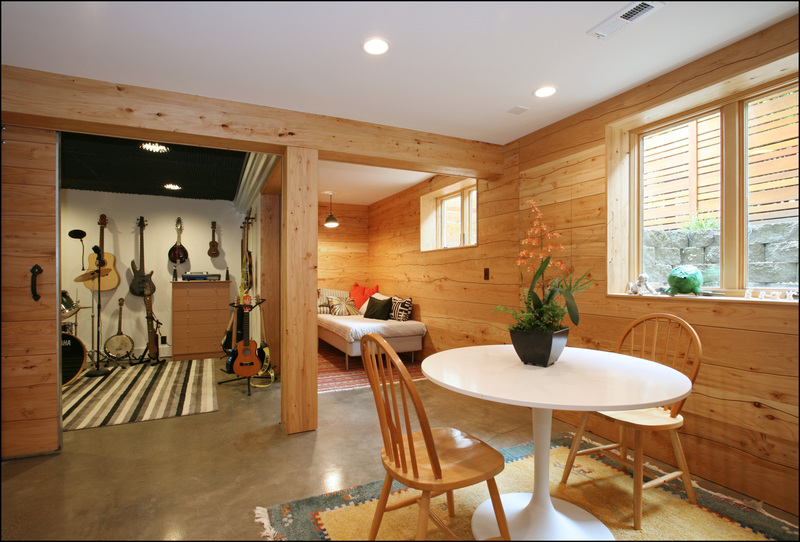 An Accessory Dwelling Unit, or ADU, is a space that is converted to legal living space that will be used specifically as a secondary living space to a primary structure. This approach will require more thoughtful consideration of the long term impact of your design choices. Whether you choose the flexibility of Airbnb or the long term ADU approach, each option will create space that will provide lasting value to your home. 1. Is my basement dry enough? No one wants to send a welcomed guest downstairs to a moist and musty quarters. And most renters will be able to quickly spot a basement with water issues. Before pursuing a basement conversion, it is vital to determine if your existing rain water management systems are doing their job to keep your basement dry. Keep an eye out for stains on the walls or floor and cracks in the foundation. Walk the exterior perimeter of your house to make sure gutters are clean and free of debris and that downspouts are directed away from the house. Make sure that large shrubs and trees are pulled away from the perimeter of your house and that the exterior grade is sloping away and down from the house. Sometimes these solutions will not solve all rainwater management problems and more extensive options such as exterior French drains or interior drains and sump pumps will need to be considered. 2. Is my unfinished basement a good candidate? Does my basement meet code? Prior to remodeling consider the requirements for code compliance in your jurisdiction. Design choices can be limited or made more expensive by code obligations, but the rules are intended to lead to greater comfort and safety in the long run. · Some stairs will meet “grandfathered-in code” and others may need to be rebuilt to meet current code requirements for stairwell width, riser height and tread depth. · Minimum ceiling heights are required in finished living areas. If your existing basement has an exposed ceiling and concrete floors, it is important to consider the loss in ceiling height when adding a ceiling and floor finish. · In order to qualify as finished living space, a basement must meet legal egress requirements for your safe escape or the entry of a rescue person during an emergency. The placement of an egress window should depend on the best location for maximum light and avoiding encroaching on property setbacks. 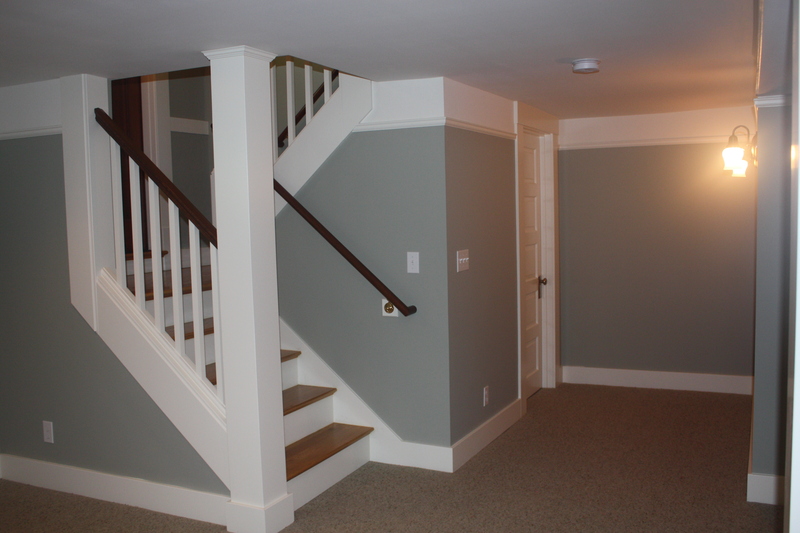 · A finished basement requires furring out concrete walls with framing, insulation and sheetrock. While this step can be costly, it is vital to the comfort of the space. 3) How long are my guests planning to stay? Retrofitting basements for Airbnb is appealing for the short term commitment to renting and the design flexibility it offers. Since an Airbnb guest suite will be occupied sporadically, your design can be planned to allow for the guest suite to double as additional living space for your family. Creating a studio, rather than a compartmentalized apartment, will give your basement the most versatility. Remember that you are creating a comfortable hotel room – so keep it simple. 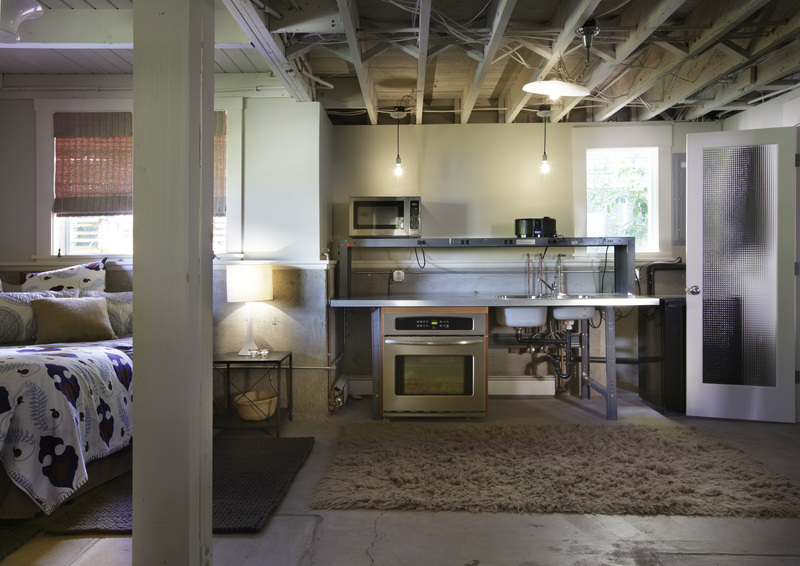 If a basement is converted to an ADU, all code regulations must be followed. In order to appeal to a long-term renter you may want to consider additional creature comforts such as enclosing and insulating your ceiling to minimize sound transmittance between floors. After meeting minimum requirements for egress, additional windows could be incorporated into the design to provide maximum daylight to the space. An ADU will require a separate entrance from the primary residence, but keeping internal access may be beneficial in the future if the guest suite is reincorporated back into your home. 4) What feeling should the space have? 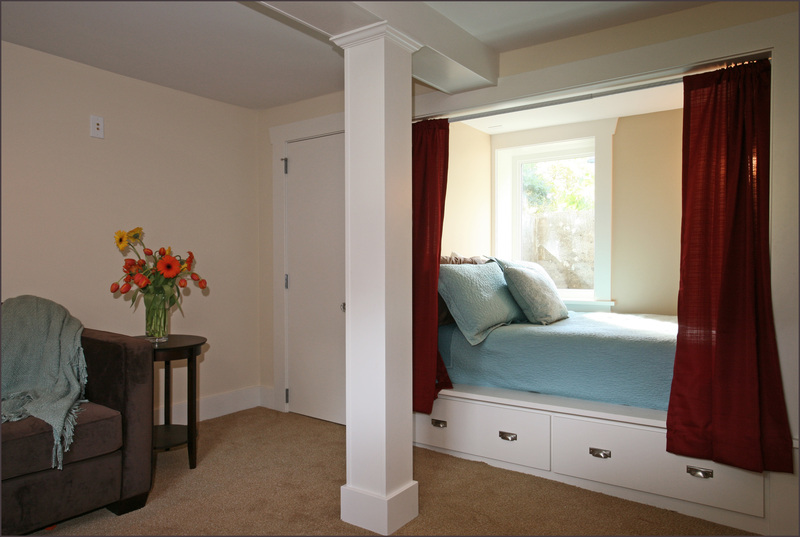 While designing your basement guest suite, it is important to identify how you want to feel in the finished space. Airbnb will allow for the most creativity in design and décor details. Since you will want to stand out in the crowd of options, putting a personal stamp on the space and featuring some of the latest trends can actually work in your favor. Some owners opt for a whimsical, theme-oriented direction. Darker colors, stained wood features, plush carpet and dimmable lighting can help to create a moody, cave-like den, perfect for those seeking a cozy getaway. If you seek to inspire creativity or create a space for a traveling executive, consider an industrial design approach featuring exposed ceilings, concrete floors and lots of light. To appeal to the masses, use your city as inspiration and decorate with local memorabilia such as maps, restaurant menus and an artsy display of your city’s tourism highlights. When planning an ADU in your basement, remember that the building will eventually be sold as a cohesive structure. Look for existing architectural details that can be carried into the basement to create an integrated and period appropriate addition to your home. When choosing color schemes, millwork profiles, lighting and plumbing fixtures, take cues from the period your home was built. 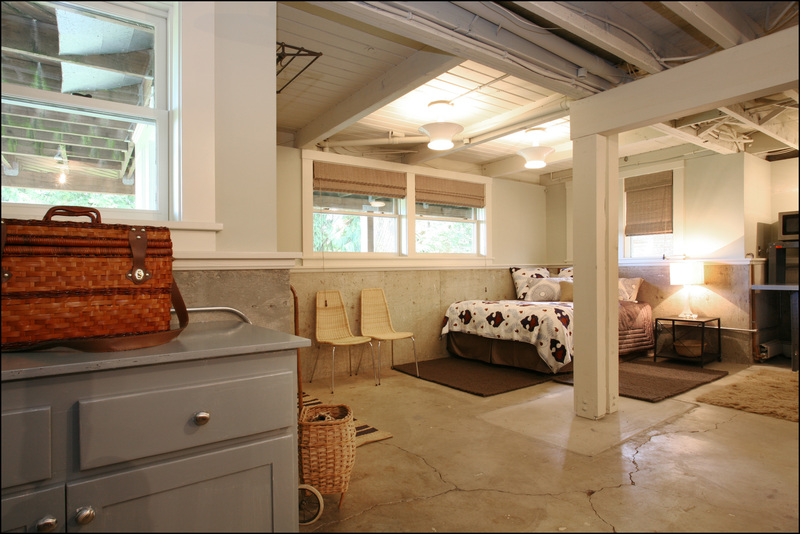 Is it a mid-century daylight basement or do you have a classic craftsman or bungalow basement? Ensure your renovation will meet ADU code requirements and fit the style of your home by engaging a design professional to help you create thoroughly planned design and specification package. Whether you choose the flexibility of Airbnb quarters or an integrated ADU rental, with careful preparation each approach can result in a guest suite that will provide lasting value to your home. ← Makeover Kitchen: Making Progress!